With some sneaky programming and a little bit of trickery, the creator of Garry's Mod flushed out a bunch of unlucky pirates and then dropped an epic banhammer on them. In the early afternoon on April 12, Garry Newman, the man behind the Source-powered Garry's Mod sandbox game, asked on Twitter if anyone was having trouble shading polygon normals. It was an innocent-sounding question about the sort of error that might pop up after the release of a new patch or expansion, but in this case Newman was asking about it not because he thought it might be an issue but because he knew it was. After all, he put it there on purpose. Newman apparently enabled the error in the game in a way that only affected pirated copies, but that was only half the battle. Included with the error message was a large number in brackets which to most people probably looked like some kind of debug code but was in fact the unique steam ID number belonging to the person reporting the problem. A simple cross-reference of numbers culled from complaints with a list of accounts which had legitimately purchased the game quickly outed those who'd pirated it, leaving them with not only a non-functioning copy of Garry's Mod but also a perma-ban from the Steam forums. Not everyone is fan of Garry's Sting, naturally; some forum commenters have expressed concern that the "exploit" could be abused or mistakenly target innocent gamers, while others are simply put off by the sheer unfairness of not being allowed to play a game they didn't pay for. I, on the other hand, find it all terribly amusing, and the pained squalling of those who got busted while seeking technical support for a game they illegally downloaded is just sweet, sugary icing on the cake of hilarity. 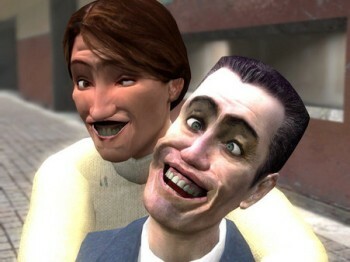 Garry's Mod, by the way, costs ten bucks and can be purchased via Steam.